I profiled interfaith model and TV host Brooke Burke last September when the new season of the ABC mega-hit, Dancing with the Stars, was about to premiere. Well, ten weeks have passed and, to my surprise, Burke is one of the three celebrity contestants–and the only woman–left in the final round, which concludes tonight at 9 p.m. on ABC. Burke had no professional training that would lead one to predict that she would be a very good dancer. Her college degree is in broadcast journalism and she has spent almost all of her career as a TV host and model. Most professional actors take some dance classes as part of their acting training and quite a few are called upon to do some dancing during some point in their career. As far as I know, Burke has done just a very little acting. She just has an innate dance talent and a strong work ethic. She started the contest showing a dance talent far more advanced than most of the other contestants–including the actor/actress contestants. Week after week, she has given truly first rate dance recitals. You can see how hard she has worked when Dancing has shown her in backstage practice sessions. Before Dancing with the Stars, I thought of Brooke Burke as a C list celebrity and a talent lightweight whose fame rested on her looks and pleasant personality. I expected the 37-year-old mother of four to be nothing more than Dancing eye candy. But I was wrong and it’s really cool that Burke has shown us her hidden resources. She has real grit and an undeniable dance talent. I’ll be rooting for you, Brooke. Key is the son of an Austrian-Jewish mother and an English father. His mother, born Ruth Lazar, fled Nazi persecution and was a child refugee to Britain. New Zealand Prime Minister John Key waiting to speak at the Asia-Pacific Economic Co-operation conference. Photo: Reuters. Key’s parents settled in New Zealand after World War II. Things took a severe turn for the worse when Key’s father, an alcoholic, died of a heart attack in 1967. John’s mother was left virtually penniless with three young children to support. The family moved into public housing and Ruth Key worked as a cleaner for many years. Key’s story is a rags-to-riches one. He managed to get a college business degree. He went on to make a fortune as a currency trader, working for Merrill-Lynch among other companies. In 2001, he was recruited to run for parliament by the National Party. He became the leader of the opposition National Party in 2006. He is a bit more centrist in his views than recent National Party leaders. On Nov. 8, New Zealand held its parliamentary elections. The conservative National Party, led by John Key, 47, won the most seats and formed a new government on November 19, replacing the Labour Party. Key gave his first speech as prime minister of New Zealand on November 20. Although he has said he is not a religious believer, Key says he often attends church with his wife, an Irish immigrant, and their two children. Rod Carew helps students celebrate inaugural ‘Baseball Day.’ Baseball Hall of Famer Rod Carew visited with students and parents in Rancho Santa Margarita at the first annual Morasha Jewish Day School Baseball Day Oct. 16. Carew told the kids to study hard and listen to parents and teachers. He also answered questions, signed autographs and threw the first pitch in the student’s waffle ball game. Rod Carew’s ties to the Jewish community go back long before this charitable appearance. Carew was born in Panama in 1945 to parents of black West Indian and Hispanic Panamanian ancestry. The future Hall-of-Famer was born on a racially segregated railroad car traveling through the then-American controlled Panama Canal Zone. His mother was dark-skinned, so she was forced to sit in the “black section” of the train and she was on the train when she went into labor with Rod. A white Jewish physician on the train, Dr. Rodney Cline, came to her aid and delivered Rod. In gratitude, Carew’s mother named him Rodney Cline Carew. 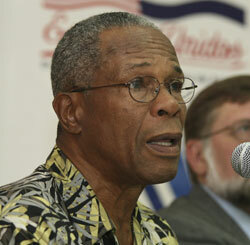 Rod Carew as baseball’s ambassador in Managua. Photo: Reuters/Oswaldo Rivas. In 1958, the Carew family moved to the then working class neighborhood of Washington Heights in Manhattan. It was and is an extremely ethnically and religiously diverse neighborhood. An outstanding high school baseball player, Carew was signed by the Minnesota Twins a day after graduating high school. Carew wasn’t a power hitter, popping out crowd-pleasing home runs. His emergence as a superstar happened over time as he turned in season after season in which he hit over .300. He played for 19 major league seasons (1967-1985), and had a remarkable lifetime batting average of .328. He had more than 3,000 lifetime hits. He was named to the All-Star team every year he played except for his final year. Carew was the American League Rookie of the Year in 1967 and earned the league MVP award in 1977. When he retired, it was a foregone conclusion that Carew would become a member of the Baseball Hall of Fame. He was elected to the Hall in 1991, his first year of eligibility. Rod and Marilyn, who are still married, had three daughters and moved to Orange County, Calif., when Carew left the Twins for the California Angels in 1979. In the mid-’70s, Jewish sportswriter for Esquire magazine erroneously reported that Carew had converted to Judaism. In point of fact, when directly asked, Carew has always politely replied that his wife is Jewish, and his daughters were raised in their mother’s Jewish faith, but he has not converted to Judaism. But the Esquire conversion story had a life of its own. I heard this urban Jewish legend sometime in the ’80s and believed it. In 2001, Shel Wallman, the editor of Jewish Sports Review, gave me the correct facts. But just about the same time, Adam Sandler came out with his first “Hanukkah Song” about Jewish and half-Jewish celebrities. The song lyrics said that Carew had converted to Judaism and this bit of misinformation got a worldwide audience. Trust me: mention Rod Carew at a bar mitzvah and three quarters of the baseball fans there will swear that Rod is a convert to Judaism. So, now, dear readers, you can set them straight. Sadly, it is true that Marilyn and Rod’s mixed religious and racial heritage didn’t help things when their daughter, Michelle, was diagnosed with leukemia in 1995. A bone marrow transplant was the only effective treatment, but finding a donor who had matched Michelle’s rather rare genetic background (Eastern European Jewish, Hispanic, black West Indian) proved impossible. Rod and Marilyn went public and appealed for donors, but no match was ever found and Michelle Carew died in 1996 at 18. The New York Daily News reported that Rod and Marilyn were devastated as they sat shiva for their daughter. A much happier note is provided by a new article on the official site of Major League Baseball. Earlier this month, Rod Carew visited his native Panama in his official capacity as a roving ambassador for baseball. A few years ago, baseball commissioner Bud Selig, who is Jewish, asked Carew to travel to foreign countries on behalf of major league baseball. Carew’s mission is to help make baseball a more international game. As he did in other countries, Carew gave baseball clinics while visiting Panama. He also visited with the president of Panama, who he knew as a child. And, in a wonderful gesture, Carew was invited to take a special train ride on the train where he was born. After his ride was over, a special ceremony was held and the train line renamed in Carew’s honor! It’s a very good day, indeed, when a formerly segregated train line is re-named in honor of a great black man.